Born in Hollywood, California, Lucie Desiree Arnaz broke the stereotype of a spoiled Hollywood child and has built a career based entirely on her own talent, charm, beauty, and drive. She could have led the idle life of an offspring of wealthy and famous parents. Instead, she has carefully and slowly built a long show business career of her own. Making her TV debut on The Lucy Show in 1962, Lucie immediately displayed two talents that have always served her well; a flair for comedy and a very photogenic face. After playing several parts on The Lucy Show, each one larger than the one before, Lucie was cast as Kim Carter on Here's Lucy in 1968. For six seasons, Lucie honed her craft in front of a live audience, as both she and the production team learned where her talents lay and how to make the best use of it. By the time the program ended in 1974, Lucie was a beautiful young woman with a great future ahead of her. Lucie realized that her talents lent themselves to musical comedy, and undertook parts in stock productions of such musicals as Once Upon a Mattress, Cabaret, L'il Abner, and Bye Bye Birdie. Concurrently, she began a series of TV movies, such as Who Is The Black Dahlia? (1975), Death Scream (1975), and The Mating Season (1980). In 1978, she received huge kudos for her role as Annie Oakly in Annie Get Your Gun at the Jones Beach Theatre on Long Island, New York. The theater world took notice and her stage career went into full gear. She wowed audiences as Gittle in the national tour of musical, Seesaw, and then became a Broadway star when she costarred with Robert Klein and Tony Roberts in They're Playing Our Song (1979). More Broadway and touring company roles followed, including two with Tommy Tune and several with Laurence Luckinbill, who became her second husband. She first married Phil Vandervoort in 1971 and separated from him the following year. She finally got divorced in 1977, prior to her marriage to Laurence Luckinbill in 1980. The Luckinbills have three children (Simon, Joseph, and Katherine), and Lucie is the stepmother of Nicholas and Ben Luckinbill. Although she has taken time out of her career from time to time to be a full-time mother, it has not stopped her from making movies (The Jazz Singer, 1980; Second Thoughts, 1983), doing stage work (Lost in Yonkers, Grace and Glorie), recording (Just in Time), and touring with her nightclub act (Las Vegas, Reno, Atlantic City, New York, Branson, Washington D.C.). 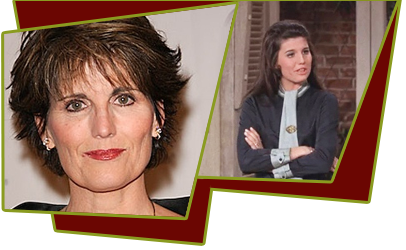 Although her two television series (The Lucie Arnaz Show, 1982; Sons & Daughters, 1991) were not ratings sucesses, they were well received critically. It seems Lucie is good at anything she chooses to try. She has won the Carbonel Award (1978), the Los Angeles Drama Critics Award (1979), the Theater World Award (1979), the Outer Critics' Circle Award (1979), the Sarah Siddons Award (1986), the Emmy Award (1993), and was nominated for the Golden Globe Award in 1980. In 1990, Lucie and Larry Luckinbill formed Arluck Entertainment, and together produced the documentary, Lucy and Desi: A Home Movie (1993). In 1997, they started Education through Entertainment, which produced two CD-ROMs: Lucy & Desi: The Scrapbooks, Volume 1, and How to Save Your Family History, a 10-Step Guide by Lucie Arnaz. Lucie and her brother, Desi, helm Desilu Too, a watchdog for the proper presentation of their parents' images and a production company. Lucie resides with her family in a beautifully redone Early American farmhouse in Katonah, New York.